One of America’s top young 3-gun shooters is a talented young lady from Missouri, Cheyenne Dalton. Now in her final year of High School, 17-year-old Cheyenne has been a top competitor in Rimfire Challenge events, as well as 3-gun matches and USPSA comps. Read more about Cheyenne in Shooting Sports USA. Dalton is a two-time Ladies Limited Rimfire World Champion, a one-time Junior Limited Rimfire World Champion, a Wyoming state games gold medalist in rimfire, and a High Lady Alabama state Rimfire Champion. Most recently, she was featured in the Fall 2018 edition of Recoil Magazine. Dalton will join the shooting team at Missouri Valley College in the Fall of 2019. This outstanding video showcases Cheyenne’s musical talents as well as her shooting skills. Cheyenne is really a remarkable young lady, with a great work ethic. Share the post "Young 3-Gun Sensation Cheyenne Dalton"
Tomorrow is October 31st, Halloween (originally called “All Hallows’ Evening”). That means kids in costumes will be ringing doorbells as soon as it gets dark. No doubt some of you proscrastinators will wait ’til the last minute to set out your Halloween decorations and Jack-O-Lanterns. Don’t worry, in the video below, our friend, 3-Gun ace Taran Butler, shows how to carve a pumpkin in just about 5.5 seconds, give or take a tenth. Taran performed this feat of speed-carving with his trusty Infinity handgun, chambered in 9mm Major. Halloween or Hallowe’en (a contraction of “All Hallows’ Evening”), also known as All Hallows’ Eve, is a yearly celebration observed on October 31, the eve of the Western Christian feast of All Hallows (or All Saints). According to many scholars, it was originally influenced by western European harvest festivals and festivals of the dead with possible pagan roots, particularly the Celtic Samhain. Others maintain that it originated independently of Samhain and has Christian roots. Share the post "Taran Butler Carves Pumpkin in Under Six Seconds With Pistol"
Janna Reeves is one of the nation’s top female 3-gun competitors. She is fast AND accurate, and she knows how to plan her stages to achieve the best results. In a series of videos produced for Brownells, Janna talks about the 3-Gun game, reviewing the latest trends in 3-Gun firearms and gear. Janna also provides stage-planning tips, offering winning strategies to employ in competition. Though these videos, Janna hopes to help novice shooters. In particular, Jenna hopes to encourage new lady shooters to get involved in 3-gun competition, a fun and challenge sport. In this action-oriented video, Janna walks through a 3-Gun course, explaining how to plan shots, movements, and reloads. Janna shares tips, tricks, and strategies that can improve your hit percentage and shave seconds off stage times. Janna offers specific advice on target transitions, loading on the move, and stage planning. Share the post "Janna Reeves Explains 3-Gun Competition in Videos"
This story appears courtesy NRABlog.com. Looking to get started in Multi-Gun competition? The NRA Outdoors 3-Gun School is a two-day course covering all the skills you’ll need to compete in the 3-Gun game. The course, hosted at Peacemaker National Training Center in West Virginia, provides hands-on training for pistol, rifle, and shotgun. Participants experience a fast-paced mix of lessons and firing drills, including actual 3-Gun stages. For 2018, two sessions are scheduled: April 21-22, and June 16-17, 2018. You don’t even have to bring guns or load your own ammo. The NRA Outdoors 3-Gun School includes everything you need with the $1600.00 price of admission. You don’t need to bring any guns, ammunition or gear! The NRA Outdoors 3-Gun School provides all firearms, ammo and equipment used for the course, including Armalite AR-pattern rifles, Benelli shotguns customized by Hayes Custom Guns, SIG Sauer pistols, and Vortex Optics. Most 3-Gun matches consist of 8 to 12 stages, with shooters engaging as many as 35 targets per stage. You’ll shoot at paper silhouettes as close as 10 feet away, and steel targets as far out as 600 yards. Time is of the essence — all stages are “on the clock”. You’re racing from station to station, your synapses firing as your transition from shotgun to rifle to pistol, close to long range, around corners, and over barriers. You’ll encounter spinner wheels, swinging bowling pins and zooming clay pigeons, all while rushing through and around a bevy of walls, barrels, windows and even vehicles. Some 3-Gun matches are shot at night (see above), where the artificial illumination creates an entirely different set of challenges. You can register now for the NRA Outdoors 3-Gun School. The first class of the year is scheduled for April 21-22, 2018, with another session later in mid-June. If you’re interested, register soon — these programs fill quickly. CLICK HERE for more information about the NRA Outdoors 3-Gun School. Learn about other training courses by visiting the NRA Outdoors website or call (844) 672-6883. In this NSSF video, Top Shot Finalist Chris Cerino reviews the hardware you’ll need for multi-gun matches. Chris talks about carbine configurations — including barrel, handguard, and optics options. Cerino also demonstrates pistol techniques and explains the key features of a belt/holster rig. Share the post "Multi-Gun Fun — NRA Outdoors 3-Gun Training School"
How’d you like to score a check for $25,000? That’s the winner’s pay-out for the 2017 NRA World Shooting Championship (WSC), which runs September 14-16 at the Peacemaker National Training Center in Glengary, WV. 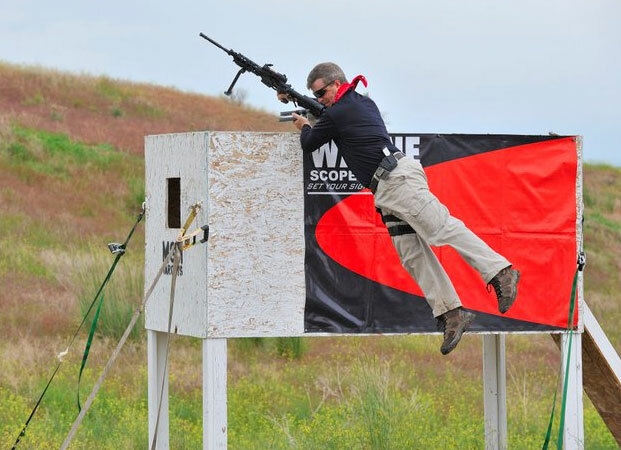 This event offers over $250,000 in cash awards and product prizes, making the WSC the richest combined shooting event in the USA (if not the world). You can still Register for the WSC — though remaining spots are filling up fast. It ain’t cheap — Pros pay $395 while amateurs and juniors pay $325. Keep in mind though that all guns and AMMO are supplied. 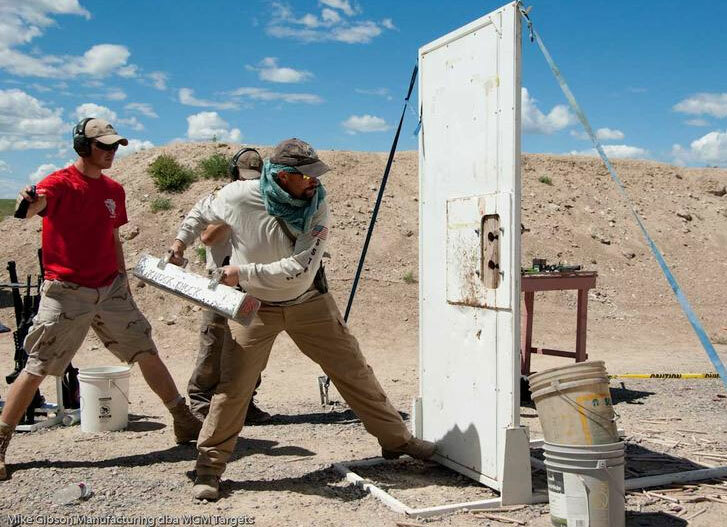 This unique 3-day multi-gun match tests competitors’ skills across twelve challenging stages involving nearly every major shooting discipline for rifles, shotguns, and pistols. REGISTER HERE. This major match attracts both sponsored Pros and “regular Joes”. For 2017, shooters will be split into two groups: a Professional Division for sponsored shooters, and the Amateur Division for non-sponsored competitors. All firearms, optics, and ammo will be provided by match sponsors for both divisions. “This year the NRA is going back to basics and returning the match to the original format of two divisions for professionals and amateurs, putting everyone on an even playing field”, said Cole McCulloch, NRA Competitive Shooting Director. The NRA World Shooting Championship will offer $250,000 in cash and prizes. Along with the $25,000 winner’s pay-out, there will be fat cash prizes for second and third place overall, High Lady, and High Amateur Junior. Then there are the prize tables — a real treasure trove. The designated Amateur prize table by itself will offer products and certificates topping $100,000 in value. NEW Random Drawings — The WSC has added a new type of prize for 2017. Ten (10) Random Draw Prize Winners of $400 will be chosen during the WSC Awards Banquet. These random drawings give every competitor a chance to win cash, no matter what their event ranking. Match entry fees are $395 for Professionals, $325 for Amateurs and Juniors. All firearms and ammunition are provided, and entry fees include one awards banquet ticket. For more information, visit WSC.NRA.org, call the WSC Coordinator at 703-267-1479, or email NRAhighpower@nrahq.org. On the official WSC.NRA.org you’ll find descriptions fo the 12 WSC stages. In addition, there is information about Peacemaker National Training Center and nearby lodging options. Competitors can register in one of two divisions: professional and amateur. The pro division is reserved for shooters who possess sponsorships, receive financial support for their competitive shooting or those who have been part of specialized firearms teams. All other shooters register in the amateur division. The playing field is completely level — every competitor uses the same guns, optics and ammunition. No competitors are allowed to bring their own gear, so everyone starts the match on equal footing. Share the post "NRA World Shooting Championship September 14-16, 2017"
For sheer “Fun with Firepower” it’s hard to beat a 3-Gun match at Raton, New Mexico. You get to play with lots of guns — rifles, pistols, and shotguns — while enjoying great views in one of North America’s most scenic shooting facilities. This past weekend many of the nation’s top 3-Gun aces were in Raton for the 2017 Rocky Mountain 3-Gun World Championship. This was held August 10-13 at the Whittington Center facility. Stages were conducted both on the designated rifle ranges as well as nearby hillsides. In 3-gun matches, all stages are “on the clock”. Competitors need to be FAST and accurate. There was a lot of Army black and yellow on the top of the podium, with USAMU shooters winning two divisions, along with the Team Event. SSG Joel Turner won the Open Division and SSG Tyler Payne won the Heavy Metal Scope Division. SFC Daniel Horner placed second in the Tactical Scope Division, while SFC Kyle McMaster finished second in the Tactical Irons Division. All four soldiers teamed up to win the Team Relay Shoot-Off competition to close out the event. 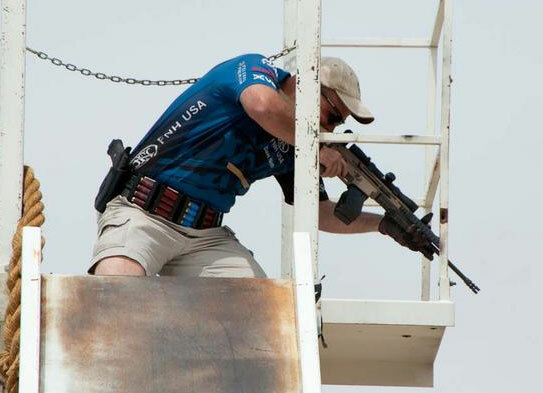 High-tech AR platform rigs are the rifles of choice for 3-Gun matches. Who wouldn’t like a chance to shoot at the Whittington Ranges? What a backdrop! Share the post "Stunning Backdrop for Rocky Mountain 3-Gun Championship"
April 20-23, 2017 NSSF presents its first-ever 3-Gun Shooting Sports Fantasy Camp, to be held at the world-class Clark County Shooting Complex in Las Vegas. This event features shooting instruction from some top pros, including Randi Rogers, Robert Vogel, Tommy Thacker, Dianna Muller, Ryan Muller, BJ Norris and Chris Cheng. You don’t even need to bring your bang-sticks — the program includes guns and all ammo (as well as meals and hotel accommodations). The April 2017 camp is sold out, but the NSSF plans more camps in the future. During the 4-day session, “campers” will learn from the pros, practice techniques, have some friendly competitions, and, of course, enjoy Las Vegas nightlife (after the shooting stops). Nevada’s Clark County Shooting Complex, located just North of Las Vegas, is the largest shooting facility in the United States. Opened in 2010, the modern 2,900-acre complex is a deluxe facility with multiple ranges, club-house, and even an RV park. Share the post "3-Gun Fantasy Camp in Las Vegas — More Guns, More Fun"
The year’s first Starlight 3-Gun Shootout, a unique night-time match, takes place March 10-11 at the Copperhead Creek Shooting Club near Marble Falls, Texas. When the sun comes down this Friday, March 10th, many of the world’s best 3-Gun shooters will add lights and lasers to their comp guns and compete for a trove of cash and prizes. This match is part of a series of night-time events to be held throughout the country in 2017. Using laser sights and firearm-mounted lights, Starlight 3-Gun competitors will shoot seven stages over two nights, 4 stages Friday night and 3 stages Saturday. The Starlight 3-Gun Championship showcases spectator-friendly pyrotechnics and special effects. Match Director Chuck Anderson says “our goal isn’t just to create a challenging course of fire. We wanted to create a course of fire [with] lights, lasers, strobes, smoke and sound that would absolutely wow spectators, too. The Starlight 3-Gun Match Series is the brainchild of Jim Shepherd, founder of the Outdoor Wire Digital Network. After Crimson Trace decided to “retire” its popular Midnight 3-Gun Invitational (M3GI) match in Oregon, Shepherd proposed taking the M3GI concept and growing it into a series of exciting night-time 3-gun events with eye-catching lighting effects. Jim writes: “Shooting for speed and accuracy is challenging enough, but ‘doing it in the dark’ [is] far more impressive for spectators. Accuracy is part of the equation, but unlike precision shooting competitions, you’re racing the clock to shave tenths of seconds off your overall times. Share the post "Night Fight: Starlight 3-Gun Match in Texas this Weekend"
Tactical ace Zak Smith of Thunder Beast Arms employs a simple, handy means to store his elevation and wind dift data — a laminated data card. To make one, first generate a come-up table, using one of the free online ballistics programs such as JBM Ballistics. You can also put the information in an Excel spreadsheet or MS Word table and print it out. You want to keep it pretty small. Once you have the card you can fold it in half and then have it laminated at a local office store or Kinko’s. You can keep this in your pocket, tape it to your stock, or tie the laminated card to your rifle. If you regularly shoot at both low and high elevations, you may want to create multiple cards (since your ballistics change with altitude). To learn more about ballistic tables and data cards, check out the excellent Practical Long-Range Rifle Shooting–Part 1 article on Zak’s website. This article offers many other insights as well–including valuable tips on caliber and rifle selection. Another option is to place your ballistics card on the back of the front flip-up scope cover. This set-up is used by Forum member Greg C. (aka “Rem40X”). With your ‘come-up’ table on the flip-up cover you can check your windage and elevation drops easily without having to move out of shooting position. Share the post "Dope for Your Scope — Handy Laminated Ballistics Card"
The 20th Annual MGM Ironman Match was held in Parma, Idaho earlier this month. Over 250 shooters vied for honors at this ultra-challenging event. The “OLHOT” (Open, Limited, Heavy Optics, and Trooper) classes competed June 5-7, while a Scoped Tactical Match followed June 9-11. Present were top pros, privateers, juniors, ladies, plus elite military and LEO teams. This very demanding 3-Gun event features ten tough, high-round count stages, including a signature zip-line descent from a tower. Without question, the MGM Ironman is one of the toughest shooting matches on the planet. This year’s OLHOT match was definitely a “family affair” for the Gibson clan. In the Trooper Division, 17-year-old Wyatt Gibson won convincingly, finishing 138 points ahead of the next-best shooter. Meanwhile Wyatt’s father Travis Gibson won the Open Division. In true ‘Like father, like son’ fashion, Travis dominated the Open field, finishing 121 points ahead of his closest Open-class competitor. This year’s aptly-named Ironman was particularly tough with triple-digit temps and strong winds. Over the course of three grueling days, competitors completed ten tough stages, shooting in excess of 1100 rounds per shooter over the course of the match. EVERY stage required the use of ALL three guns with 100 or more rounds. The average time spent shooting on each stage was about seven minutes. The Ironman is long, intense, and you shoot till you drop! Mike Gibson, the founder of MGM Targets, and the “inventor” of the Ironman, has said: “This match isn’t for weenies or crybabies”. The week-long Ironman event is broken into two, 3-day sessions, with five different divisions. The OLHOT (Open, Limited, Heavy Optics, and Trooper) sessions ran June 5-7. During the second segment, held June 9-11, 120 Scoped Tactical shooters took on the same demanding course. Of course there are plenty of MGM-made reactive targets (photo right). The MGM Ironman regularly offers unique and demanding stages including firing a pistol from a zip line, and plunging down a steep slide from a 30 foot tower, rifle in hand. One stage involves carrying an 80-lb dummy over 100 feet and lifting it to the top of a six-foot platform before climbing it to engage rifle targets at distance. With creative and challenging stage designs and high round counts, he Ironman is truly a unique match. Share the post "Father and Son Win Big at 2016 MGM Ironman Event"
Summer is the time of year to get outside and have fun with family and friends. A great way to enjoy shooting with friends and family members is to attend a Brownells/NRA Day. These fun events will be held throughout the summer, at locations across the USA. These events are designed for all ages — from youngsters to senior citizens. The activities appeal to all skill levels, from first-time shooters to seasoned competitors. Brownells/NRA Day events are fun affairs, where participants can try out a variety of different shooting disciplines. Events are always a big hit and you won’t find people as friendly and helping anywhere else. Below is a complete list of upcoming July events. There are a variety of events, including Basic Firearms Training, Youth “SportsFest”, 3-Gun Experience, Hunter’s Event, Competition, and Shotgun. For more information on any scheduled event, visit the Brownells/NRA Day website. Share the post "Enjoy Family Fun at a Brownells / NRA Day Event"
There’s no denying that 3-Gun competition is growing in popularity nationwide. Using a pistol, rifle and shotgun to shoot multiple targets at varying distances is exciting and challenging. Here are some pointers for performing better on the 3-Gun range by the USAMU’s SSG Daniel Horner, a two-time winner of Crimson Trace’s Midnight 3-Gun Invitational (M3GI) match. “I use the same gear all year long, so when it comes time for this match (the M3GI), I just adapt the guns, so they will work for the night time,” stated Daniel Horner. “I attach the Crimson Trace lasers and lights to the guns in whatever is the easiest way possible. Last year I just screwed a rail to my shotgun with wood screws. So, people can compete with pretty much whatever they have available and make it work.” Horner also recommends using a pair of head-mounted lamps. One can illuminate your firearms’ iron sights while the other headlamp is aimed at the targets. Share the post "Competition Tips from 3-Gun Wizard Daniel Horner"